Four Seasons at Cedar Grove is a 55+ community in Essex County, New Jersey. There are 156 low-maintenance condominiums that provide open floor plans and garage parking. Four Seasons at Cedar Grove creates a carefree existence for residents by taking care of lawn upkeep, snow removal and maintenance of the amenities. The focal point of Four Seasons at Cedar Grove is the inviting clubhouse where residents gather on a regular basis to enjoy indoor and outdoor amenities. This close-knit neighborhood is small enough to maintain a friendly atmosphere, while allowing a social aspect suitable for today’s active adults and retirees. Four Seasons at Cedar Grove offers wonderful amenities that cater to the social and physical needs of active adults. The community clubhouse is the central hub for exciting events and activities at Four Seasons at Cedar Grove. The charming clubhouse is available exclusively to the residents of the community. Here residents can work out in the fitness room or join neighbors in a game of cards or billiards. Outdoors, residents can gather at the community gazebo, take a dip in the pool, or play a match on the tennis court. There is even a putting green for golf enthusiasts. Four Seasons at Cedar Grove features 156 luxurious condo units in 13 buildings. K. Hovnanian built these low-maintenance residences from 2000 to 2005. These thoughtfully designed homes average about 2,600 square feet of living space and include a variety of features that appeal to an active adult lifestyle. Most homes feature two bedrooms, two bathrooms and a den that can be used as an additional bedroom. Each residence has two parking spaces in the garage, one is assigned and the other is on a first come basis. Residents of Four Seasons at Cedar Grove enjoy living in an age-restricted community with low-maintenance homes. This small community is ideal for active adults who want to enjoy the luxury that comes with minimal maintenance in a tranquil setting. Residents love to gather in the clubhouse for card games, billiards and community parties. The amenities, community events and welcoming atmosphere give residents many opportunities to get to know their neighbors. Four Seasons at Cedar Grove is located in Essex County in New Jersey. It is conveniently located just off of Route 23 and close to I-80, I-286 and the Garden State Parkway making travel easy. Residents are readily accessible to shopping centers, restaurants and medical facilities. The Willowbrook Mall is within two miles and offers a variety of stores for all of your shopping needs. Attractions nearby include the Hamilton House Museum, Montclair Art Museum, 4th Wall Theatre and Bloomfield Symphony Orchestra. New York is only a 40-minute drive from the community and Philadelphia is about two hours away providing additional entertainment. Four Seasons at Cedar Grove has the ideal location and community for today’s active adult homebuyer. There are plenty of activities available in Four Seasons at Cedar Grove. Here is a sample of some of the clubs, activities and classes offered here. Four Seasons at Cedar Grove features 156 luxurious condo units in 13 buildings. K. Hovnanian built these low-maintenance residences from 2000 to 2005. These thoughtfully designed homes average about 2,600 square feet of living space and include a variety of features that appeal to an active adult lifestyle. Most homes feature two bedrooms, two bathrooms and a den that can be used as an additional bedroom. Each resident has two parking spaces in the garage, one is assigned and the other is on a first come basis. Please Note: Not all floor plans are shown below. At first I was concerned about spending so much on a home for retirement, but I have been completely satisfied with our decision to move here. All the amenities are top notch and our home is perfect. The location is great and it's been fantastic trading in all our old house maintenance for this new lifestyle. I never want to own a lawn mower again! 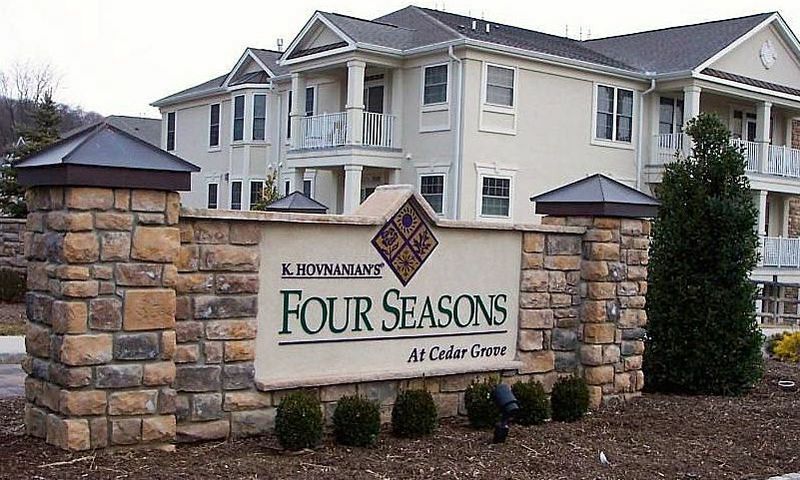 55places.com is not affiliated with the developer(s) or homeowners association of Four Seasons at Cedar Grove. The information you submit is distributed to a 55places.com Partner Agent, who is a licensed real estate agent. The information regarding Four Seasons at Cedar Grove has not been verified or approved by the developer or homeowners association. Please verify all information prior to purchasing. 55places.com is not responsible for any errors regarding the information displayed on this website.